Women did not have as hard a time in Anglo-Saxon high society as they were to do in later ages. 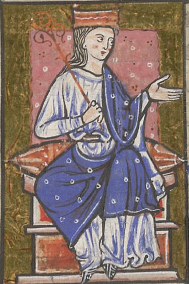 An example of the respect that was shown to high-born women is Aethelflaed, the eldest daughter of King Alfred of Wessex. She was to have a major impact on developments in England, especially after her father’s death in 899. King Alfred the Great is renowned for having fought off the threat from Danish invaders and turned the tide of what had looked like inevitable defeat. However, Alfred only ruled in Wessex, which was the south and south-west of England. Between his kingdom and the Danelaw (the eastern part of England that was ceded to the Danes) lay the larger kingdom of Mercia. Were Mercia to fall, Wessex would again be threatened. Alfred left his daughter the large sum of one hundred pounds and a royal estate. She had already been married for several years, her husband being Ethelred of Mercia. The couple proved to be effective joint rulers of Mercia, with Aethelflaed playing an active role in decision-making when it came to defending the kingdom. Ethelred did not enjoy good health, which placed greater burdens on Aethelflaed; these were increased even further when Ethelred died in 911. Aethelflaed now took over the role of sole ruler, being known as “The Lady of the Mercians”. Although there is no evidence that she took a direct fighting role in any battles against the Danes, she certainly planned campaigns and inspired her troops to greater efforts. Alfred had been succeeded in Wessex by his son Edward, who joined his sister in campaigning against the Danes. Together they forced the Danes north to the River Humber and freed East Anglia. Aethelflaed had learned an important lesson from her father, which was to defend territory that had been won by building fortified towns that would act not only as population centres but be places of refuge for farmers in the area should danger threaten. These “burhs” were established throughout Mercia and would form the basis of “boroughs” that exist to the present day. Among them were Tamworth, Warwick, Runcorn and Stafford. As Aethelflaed’s armies moved north they captured the Dane-held cities of Derby and Leicester and she was on the point of taking York, the Danish capital, when she died in 918. Aethelflaed’s doughty spirit was to live on in her nephew, Edward’s son Athelstan. Edward so admired his sister that he sent his son to be brought up by her and gain an apprenticeship in statecraft. The training and example were to pay dividends, in that Athelstan would later unite the kingdoms of England and be entitled to claim the honour of being the first king of all-England. Aethelflaed’s name is not often brought up in discussions about where the roots of England lie. However, perhaps the Lady of the Mercians deserves to be better remembered as one of the group of remarkable people who saved England from foreign dominance in the 8th/9th centuries.